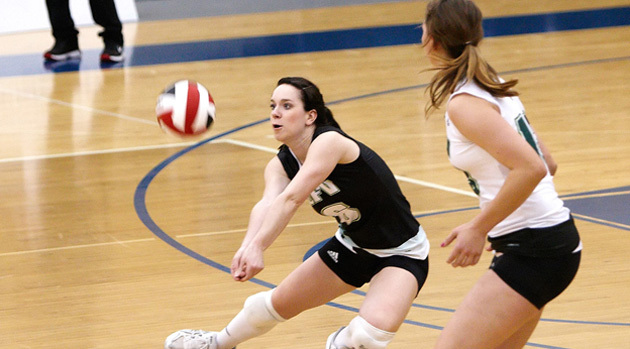 The UFV women's volleyball team is currently in first place in league play and has received funding confirmation for the 2012/13 season. The University of the Fraser Valley has renewed its commitment to five of its athletic teams for the 2012/13 year. The men’s and women’s volleyball teams , the men’s and women’s rowing teams, and the men’s golf team will all receive some funding from the university for the next academic and athletic year, which starts in September 2012. UFV Athletics includes teams that compete within the Canadian Interuniversity Sport (CIS) system, and those that compete in other post-secondary associations. UFV’s men’s and women’s basketball and soccer teams play at the CIS level, and will continue to do so. In order to compete in the CIS, UFV has to agree to fund these teams at a certain level each year. What had been in question was the university’s ability to continue to support its non-CIS teams in a tight budget climate. In previous years, UFV provided approximately $100,000 on a year-by-year basis to these teams. This upcoming year, UFV will provide $50,000 from special one-time funding sources to support the non-CIS teams. The teams have raised approximately $38,000 in funds and/or letters of commitment from other sources in order to continue to compete. UFV is continuing to seek other funding sources and models, and additional community support, for all of its athletics teams.